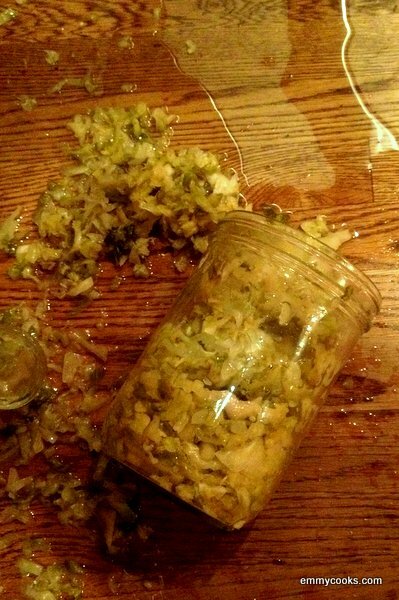 My first half-gallon of tangy, delicious sauerkraut ended badly… …and I found myself looking for ways to serve the last few brine-less cups left in the bottom of the jar. I pondered. My grandparents all lived in Chicago when I was growing up, and visits to them were a marked departure from California’s alfalfa sprouts and vegetarian burritos. Hot dogs. Jewish delis. Sauerkraut heaven. My grandfather, now 98 and still an appreciative epicure, once credited his longevity to the preservatives in those Chicago hot dogs. Although maybe it was the sauerkraut. But hot dogs aren’t my thing these days, and I feel a little skeptical of even the not-meat types. 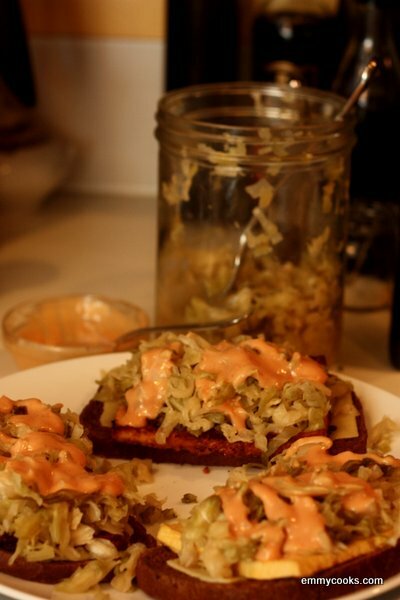 So I made Tofu Reubens, of course. Aside from the kids’ near-daily PB&Js, I rarely make sandwiches at home. I always think that sandwiches are the kind of food that taste better if someone else makes them for you, you know? (Except for any variation of grilled cheese, maybe.) But I’ll be making these sandwiches again. And again. They were everything I ask of a sandwich: flavorful, hearty, crisp on the edges and sloppy within. We served them with pickle spears and fries, of course. There are a few things going on here, so get yourself organized in advance. (You are probably always organized in advance. Consider that an admonition to myself, then.) Make your sauce. Bake your tofu into savory, spicy planks. Assemble your sandwiches and then grill them all at once, so that you are ready to crunch into your hot sandwich the minute those fries come out of the oven. 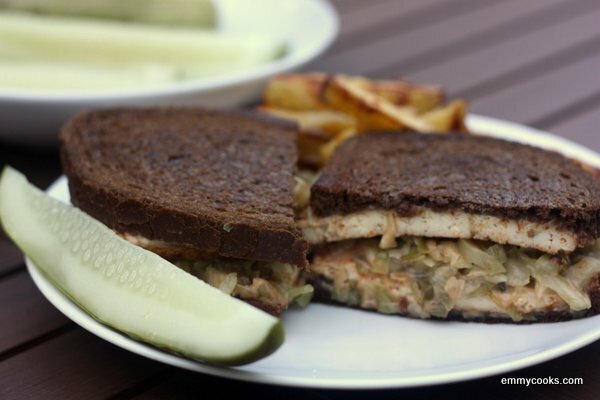 Tofu Reuben Sandwiches: For two sandwiches, press the water from a block of tofu then cut it into 1/4″ planks (so that you have four large thin rectangles). In a shallow pan, mix up a marinade of 2 Tbsp. neutral-tasting oil, 2 Tbsp. soy sauce, and 1 Tbsp. pureed chipotles in adobo. * Coat the tofu slices well in the marinade (there will be some left over; try oiling your fries with it before baking them) and bake them at 400 until the tofu is firm and/or you’re happy with the texture and ready to make your sandwiches, 15-30 minutes. For each sandwich, butter two slices of rye bread and place one butter-side-down on a plate. Layer as follows: a thin slice of swiss cheese, a slice of baked tofu, a heaping mound of squeezed-dry sauerkraut, a generous drizzle of sauce, another slice of tofu, another slice of cheese, then the second piece of bread, butter-side-up. Grill the sandwiches on a pan or griddle over moderate heat (so that the insides have time to warm up before the bread gets too toasty), pressing them down a bit with a spatula and flipping once when the first side is perfectly toasted. Serve immediately. This entry was posted in Food, Recipes, Tofu and tagged reuben, sandwiches, spilled sauerkraut, tofu, vegetarian reuben on August 22, 2012 by emmycooks. Thanks for visiting emmycooks.com! If you’d like to see more, here are some of my favorite recent recipes from May, June, and July. If you like what you see on emmycooks.com, you can sign up there to receive a daily recipe by email, or follow Emmy Cooks on Facebook, Twitter, or Pinterest. Ooooh, yum! Sorry about the sauerkraut disaster – but at least some was deliciously salvageable! A friend of mine made sauerkraut with carrots and onions. I make stuffed cabbage with sauerkraut and tomatoes. Great with mashed potatoes covered with the juice. I got this recipe From a Hungarian woman many years ago. It is a good cold weather dish. That sounds great! I have a jar of sauerkraut that’s about ready to eat, I’m going to add some to cabbage rolls with mashed potatoes. Thanks for the suggestion!